Roba Dolce started in 2005 as a small gelato company on just a handful of Rhode Island supermarket shelves. There all natural line caught on and they are now on more than 7000 shelves. In late 2010, they signed a 5 year deal to become the official frozen dessert of our local and beloved New England Patriots. 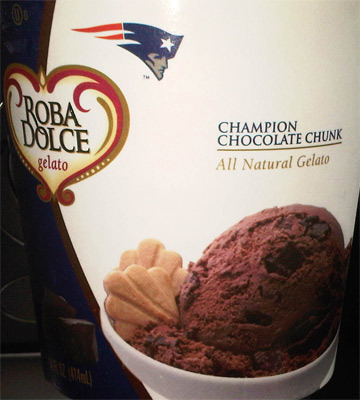 The announcement stated "The agreement gives Roba Dolce, a leading producer of authentic premium Italian gelato and sorbetto, the rights to use team marks as part of a new Patriots product line coming to retail this spring. Roba Dolce will also benefit from sales of their product at Gillette Stadium, where old-fashioned serving carts are located in the concourses." What does this all mean? and why should you care about the Patriots and that pretty boy Tom Brady? I understand, I really do, everyday that man tries to sell me a watch I can't afford... oh who am I kidding, New England loves Tom Brady. Anyway, sorry. I ran into Walgreen's hoping to score one of the new Mars ice creams, but instead my eye is caught by a pint of ice cream with the Pats logo on it. How can this be? You can't even say super bowl anymore without being sued from 17 different angles. 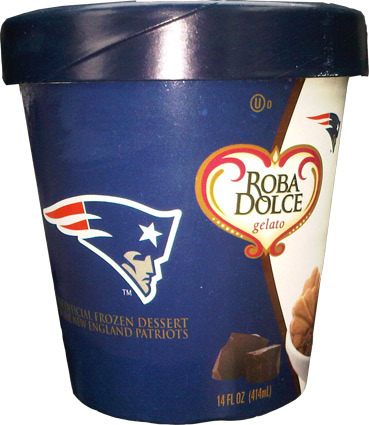 Well it turns out that Roba Dolce has used their new partnership and turned their 900ml tubs into Patriot pints. Well, faux pints anyway... stupid 14 fluid ounces. Look, I know the idea of a local company making a deal with a local team is nothing new, but what I do like is that they've gone ahead and used this an excuse to jump to the pint size... well, not that jumping to the (faux) pint is something new either. At least $3.59 ain't too bad. Our treat is just (dark) chocolate gelato with dark chocolate chunks. There are a few ice crystals, but it didn't seem to affect anything. The chunks are a really good size and have a nice thud when you crunch them. I got at least one per scoop and was really surprised that I kept finding them over and over again. Now I've got two big points on this one: First off, this doesn't really taste like gelato to me, it tastes like regular ice cream. Oh, it's made well enough, it just doesn't taste like Talenti for example. Second, the rich cocoa flavor actually wears you down after a bit. I was dieing for a glass of milk by the time I finished my first serving. The chunks really have the dry cocoa taste and I don't think the base is a milk chocolate, so the dryness has a real cumulative effect that can't be easily forgotten... except with maybe a tall, cold glass of chocolate milk. Mmmmmmmm, that would probably actually work to keep this treat in balance. So, decent job on this one. I appreciate the fact that there aren't any artificial flavors or vibes with this one, I just wish it wasn't so dry. Oh well, guess that's what I get for loving dark chocolate! On Second Scoop: Greetings. Just to clarify, this isn't a bad treat. If you need a dark chocolate fix, and you don't mind that bit of dryness that sometimes comes with dark chocolate, then you should enjoy this treat. I definitely like the fact that there are plenty of chunks, but the whole treat definitely has a dry texture and taste to it. Maybe all their gelatos do, I'm just not sure yet. 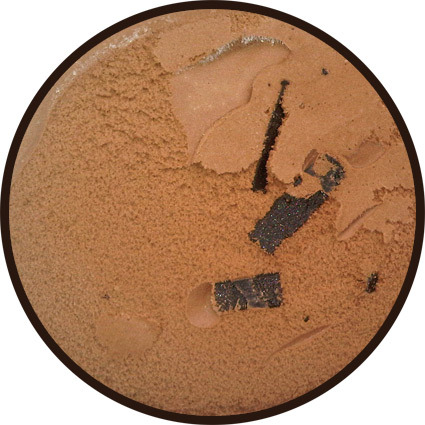 Even before you said it, I thought this looked inferior to Talenti's double dark chocolate.